The WGA holds a conference each spring, alternating locations between Edmonton and Calgary. The first conference was held in Edmonton on April 24-26, 1981. Our 2019 Conference, Writing Across Worlds, will be held in Edmonton June 7 - 9 at the Coast Edmonton Plaza Hotel. It is the 39th conference for the Writers' Guild of Alberta. Themes will explore literary works that cross forms, genres, and cultures, as well as how storytelling is crossing into new realms—from the digital sphere to the sleeves of our coffee cups—and into the psychological space of our daily routines. We will offer keynote lectures, panel discussions, networking and social opportunities, and individual workshops devoted to creative nonfiction, poetry, fiction, and speculative fiction. All writers from across the province and beyond are welcome to register. Three spotlight presenters include Griffin-nominated poet and novelist Ian Williams, (Reproduction, Penguin Random House, 2019), accomplished author Larissa Lai (The Tiger Flu, Arsenal Pulp, 2018), and Senior Agent with the Transatlantic Agency, Carolyn Forde. Before her current role with Toronto-based Transatlantic, Carolyn was an agent and International Rights Director at Westwood Creative Artists for 14 years. Our full schedule of sessions and presenters are currently showcased on our website. Our AGM takes place during the annual conference and is open to all current members of the WGA. Why Attend a WGA Conference? We know that a writer needs to reflect, imagine, try things out, listen, go deep, get into flow--be in solitude. But writers also need time and space to meet one another, share experiences and knowledge, meet with an editor to see if they're on the right track, and to grow professionally. This is what our conference offers. 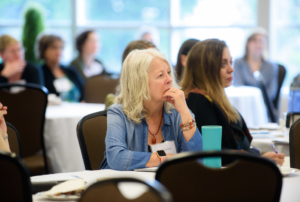 We make every effort to plan relevant professional development sessions, engaging keynote speakers, and time for welcoming and celebrating writers. We'd love to have you as part of our Alberta writing community. Being around other writers gives me energy and refocuses me. Gets me back on track about my own writing. Gives me new ideas, new contacts and brings me up to date with what's happening in the literary world. i.e.... I didn't know there was a 'one page novel!" It is a wonderful way to network with fellow writers in the writing community." It is the place where we put dimension to our online contacts and studies in the literary arts. It is where we re-assert our identity as writers." It's a wonderful weekend of community, something we all need once in a while. The WGA has many different members' opinions and tastes to attend to, and the conference manages to cover a pretty good range of them. Plus, WGA members and conference speakers all seem open and friendly to meeting new-to-them writers. It's a great chance to build one's community and resource bank." The blue pencil alone was worth the price of admission for me. The wordplay and keynote speech were also good information and a lot of fun. I think writers can learn a lot and have fun with these kinds of formats." If you belong to an organization, you don't get much value for your membership fee if you don't take part. And the annual conference is the best way of taking part in a whole lot of things in one swoop." The WGA conference is open to all adult and young adult writers. We make an effort to cover a wide range of topics relevant to contemporary writers, and to hold our meetings in accessible venues. Our equity committee is working on a more comprehensive statement on inclusivity.